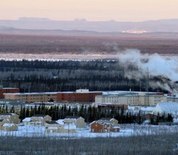 Fort Greely is located approximately 100 miles southeast of Fairbanks, Alaska and serves as a launch site for anti-ballistic missiles. The area is one of the coldest in Alaska and provides an ideal environment for testing equipment in cold and extreme cold weather, therefore the Cold Regions Test Center is also based at Greely. This Fort Greely directory features the critical info you’ll need to navigate through the many facilities and recreational opportunities available on base.